The federal government released its national poverty reduction strategy “Opportunities for All” last month. The plan has implications for the soon-to be released Manitoba poverty reduction plan. The federal and provincial governments must take serious action to bring down poverty rates in Canada. Incremental change will make little difference in the lives of those struggling in poverty. Poverty reduction plans are advocated by anti-poverty activists to set a clear path to ending poverty using a measured and accounted for government-wide coordinated approach. Please see the CCPA National blog on the federal plan for an overall analysis. 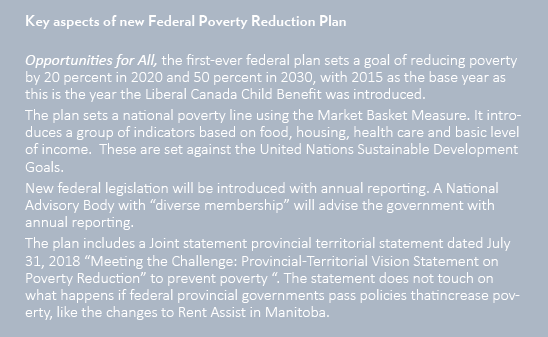 The new federal plan assembles programs and commitments related to poverty in one document, but with no new money announced for implementation. Manitoba’s poverty challenges require radical investment to end suffering and promote justice, particularly as it relates to Truth and Reconciliation. The federal government has legislative and treaty responsibility to provide programs and services to Indigenous people on reserve, and in some cases off reserve. The disastrous consequences of unfulfilled federal obligations for adequate social services, housing, water & more hugely impact Manitoba. Manitoba’s on-reserve child poverty rate is a shocking 76% and 39% off reserve – the highest in the country (MacDonald and Wilson, 2016). Indigenous Manitobans on reserve are more likely to rely on federal welfare, called Income Assistance, 46.9%, compared to 33.6% average in Canada in 2017 (Clark, 2017). Federal Income Assistance rates are tied to provincial Employment and Income Assistance rates and woefully inadequate. Income transfers combined with economic development are key to bringing down poverty rates on and off reserve. Community-led solutions to poverty are all around us, and it is our hope governments seriously listen to community in the creation of, and investment in, action plans to end poverty. The View from Here: Manitobans call for a Renewed Poverty Reduction Plan includes 49 evidence-based community responses to poverty. This report was endorsed by 150 organizations, including Make Poverty History Manitoba (MPHM). MPHM worked with community groups to prioritize five areas for action based on The View from Here. In the Manitoba 2016 election, all political parties campaigned on reducing poverty. To date the provincial government has done little and even reduced Rent Assist benefits and other programs that help to reduce poverty. The provincial poverty plan is a year and a half overdue from its planned release, in violation of the Poverty Reduction and Social Inclusion Act. Welfare rates are sorely inadequate due to government decades-long holidays on inflationary increases. In Manitoba single adults on social assistance are 47% below the poverty line (Market Basket Measure, MBM) and people on disability are 33% below. Each year, assistance slips further and further below the cost of living. Another major problem with welfare for those who are able to get paid work: any earned revenue is clawed back 70% (after the first $200) and benefits such as dental and prescriptions are lost when one starts working. This makes it very hard to leave welfare. In response to these problems MPHM announced its “Livable Basic Needs Benefit” campaign last February. MPHM proposes a provincial benefit set to the poverty line that tapers off with earned income, established outside of welfare. MPHM’s provincial policy recommendation could be boosted with support from the federal government for implementation. Federal support for Make Poverty History Manitoba’s program could come in the form of an increase to Manitoba’s transfer payments to help bring basic needs benefits up to the poverty line. The 2018 CCPA Alternative Federal Budget calls on Ottawa to create a new $4 billion annual federal transfer payment to provinces/ territories tied to adequate social and disability benefit rates and positive outcomes in reducing poverty. Unfortunately this is not in the new federal plan. The cornerstone of the federal government’s poverty reduction plan is the Canada Child Benefit (CCB). Campaign 2000 rightly pointed out that the Canada Child Benefit is not an anti-poverty program; families with children who receive this benefit are still below the poverty line. On top of this, CCB transfers money to parents but there is a terrible lack of quality affordable childcare. Manitoba is 10th out of the 11 provinces and territories with child care for only 31% of children according to Child Care Deserts in Canada. Manitoba’s wait list grew from 12,000 in 2016 to 15,487 children waiting for licensed childcare as of February 2018. Canada’s economic productivity would increase if those unable to work for pay due to lack of childcare were able to join the workforce said Stephen Poloz, head of the Bank of Canada. The federal government must work with provinces and territories to create a universal publicly accessible child care system for all ASAP. Families require child care to earn money or get an education. And it’s important for child development and school readiness. Much of the federal government’s efforts are on the “deserving poor”- families with children and seniors. But most of the poor are not those on assistance, but working poor according to CCPA’s Alternative Federal Budget. There is nothing in the federal plan about increasing the federal minimum wage to a living wage, adopting a federal government living wage policy or encouraging provinces to increase their minimum wages to $15 or a living wage. These actions would lead by example on the importance of paying a fair wage and put pressure on provinces to do the same. People can find themselves struggling with poverty due to mental health concerns or addictions. Poverty is extremely stressful and can exacerbate these as well. High meth use in Manitoba is impacting crime rates (see “Meth is a Symptom, Poverty is the Crisis”. )To combat the negative impacts of meth use, government poverty plans must deal with the root causes of addictions and mental health concerns via comprehensive poverty reduction plans including social housing and inadequate social assistance rates. A lack of treatment facilities and no cost community supports are only exacerbating the crisis. MPHM recommends an increase in provincial mental health spending by 40 percent over three years. Additional federal funding for the opioid crisis will help, but should be no substitute for provincial investments. The Right to Housing Coalition and Make Poverty History Manitoba have long called on the province and the federal government to each commit to building hundreds of units of social housing per year. The National Housing Strategy launched last November provides $40 billion over 10 years to provinces to reduce core housing need. After decades of neglect, the new federal plan is a promising step, but much more is needed. The Manitoba government has not committed to building any new social housing since elected in 2016, and has sold off some of its stock to the private market. Two years after beginning consultations, we are still waiting on the release of the provincial housing strategy. Manitoba should match federal funding in order to maximize impact. Housing is the cornerstone of poverty reduction. Those in quality affordable housing, in study after study, can escape poverty and improve health and educational outcomes. Manitoba cannot afford to skimp on social housing investment. The National Housing Benefit will be a rent supplement to those in need, with a planned implementation date of 2020. Under development by the federal and provincial governments, the Benefit will look different in each province. The federal government has stated the new National Housing Benefit is not meant to replace existing rent subsidies like Rent Assist, but to meet the “unique needs” of Canadians. With expiring operating agreements and high and rising rental rates, Rent Assist is not going far enough to bring Manitoba renters out of core housing need. The National Housing Benefit should be designed to close the affordability gap for those in greatest need and those who are most vulnerable. The five MPHM priority areas are part of the puzzle of solving poverty in our province and country. The federal and provincial poverty plans rely on each other to truly reduce poverty. New investments in Manitoba will be needed to do this and not rely only on the National Housing Strategy and other federal programs. MPHM and its supporters are looking for a solid plan in Manitoba to substantially bring down poverty rates by targeted dates with strong accountability mechanisms. LIM AT: household low income if its after-tax income is less than half of the median after-tax income of all households in Canada. Sources: Statistics Canada, 2016 Census of Population, Statistics Canada Catalogue no. 98-400-X2016148. Molly McCracken is the director of the Canadian Centre for Policy Alternatives Manitoba and a member of the Steering Committee for Make Poverty History Manitoba.